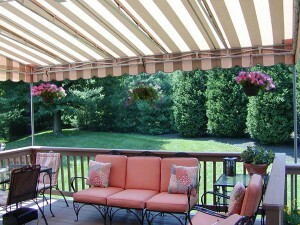 Can I enhance the value of my Home with Custom Awnings? Are you putting up your home for sale or simply want to complete some Home Improvement Projects for added value? You may want to consider adding custom awnings to your residential property to increase your home value. Awnings are architectural structures that can add significant value to any residential property. Custom awnings have a way of adding charm to any homestyle. You can have permanent awning structures installed to windows, doors,decks and patios or you can have custom canopies or retractable awnings designed for your property for great flexibility. Awnings are great home improvement accessories because residential items help expand the outdoor usability while enhancing curb appeal. You add unlimited personality to your home by getting creative with your awning designs. When starting a residential awning project, you should always hire a professional awning company like Carroll Awning Company to have the job well done. The last thing you need is a faulty awning installation while completing home improvement projects. A professional awning company will make sure your awnings are properly mounted and save for usage. By having awnings created for your home, you will save on your energy cost and improve the livability of the home. Windows awnings, Retractable Awnings and overall custom awnings are available for all residential property. You will have a choice on having manual or motorized awnings installed. No matter your selection, your selection, you will reap the benefits of a more efficient home. The extra convenience awnings provide will surely help your home stand out in all the right ways. You will notice less insects and dust accumulation at your home property because awnings are designed to eliminate dust accumulation, while keeping pests outdoors. Learn about Carroll Awning Company’s custom awnings today to start planning out your next home improvement project. You won’t regret it. Carroll Awning Company is ready to help you transform your dream outdoor design to reality. Have a look at our retractable awnings, residential awnings and canopies today to see what we can do for your outdoor space.